Further investigation into the leaked iOS 11 GM firmware file has yielded additional information about Apple’s upcoming iPhone X and iPhone 8 devices. Those devices are set to be officially announced during tomorrow’s dedicated media event, but recent reveals have given us insight into what’s coming, with today’s information focusing on iPhone hardware aspects such as the processor, RAM, and the wireless charging capabilities of each device. No doubt when iPhone 8 and iPhone X launch, there will be an instant comparison between some of the top-of-the-range Android devices. To that end, it’s worth taking a peek at what the latest investigations into the leaked firmware file have revealed about the internals of the hardware. Developer Longhorn, or @never_released as known on Twitter, has determined that iPhone X will ship with what is being called an A11 processor complete with 6 cores. The developer believes that the chip consists of two “Monsoon” cores for processing requirements, and four “Mistral” cores for high-powered work required by the device. 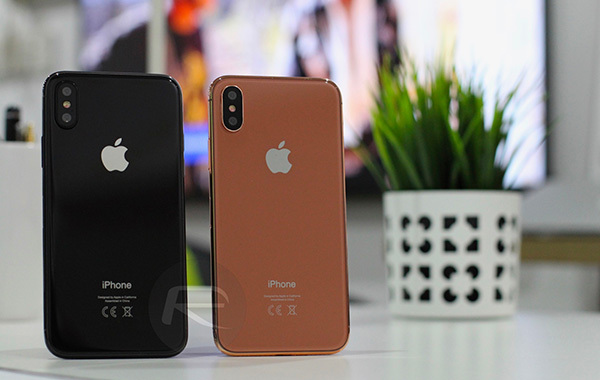 What still remains unclear is whether or not that A11 chip with the same architecture will be used in both iPhone 8 models as well as iPhone X, or solely in iPhone X.
Steve Troughton-Smith has also taken to Twitter to “confirm” the RAM levels in each device, suggesting that iOS 11 GM code reveals iPhone 8 will come with an internal 2GB of RAM (just like iPhone 7), with iPhone 8 Plus and iPhone X both packing in 3GB (just like iPhone 7 Plus). 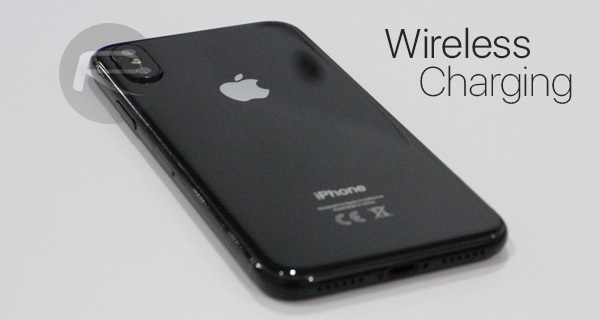 The leaked firmware files also reveal multiple references to wireless charging in the strings as discovered by Guilherme Rambo, with the current best guess being that all supported devices will conform to the accepted Qi standard for inductive charging, but it’s likely that “Made for iPhone” certification from Apple will be required for accessory makers to manufacture wireless charging pads that are guaranteed to work safely with the new iPhone models. Some people have raised questions about Apple’s new Face ID system, and, more specifically, how that will work in conjunction with Apple Pay. Developer Jeffrey Grossman appears to have dug out a little more information on that subject from the leaked iOS 11 GM. 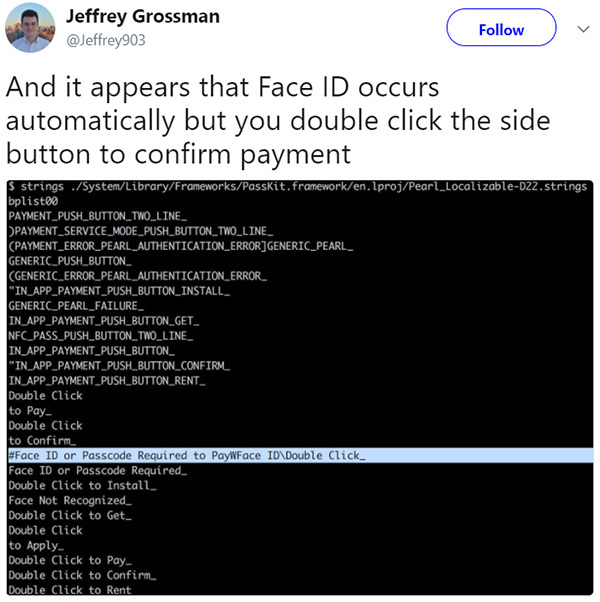 The discovered information suggests that Face ID will indeed be used to determine that the user is valid in order to authenticate a payment using Apple Pay as the payment method. Once the system has verified the user’s authenticity, a double-click on the new “Side button” would be used to confirm the payment. It would have to be placed into a pad, how else would it charge wirelessly? Be charging while its in your pocket? My body doesn’t charge things unfortunately. There were rumors earlier of true wireless charging awhile back. There have been a few working prototypes as well by some companies. Look at the Motherbox for example. It isn’t so far fetched as you might think. Just because it doesn’t exist on any phones out there now, doesn’t mean it won’t in the near future. Yeah it will be via a pad of course like the Samsung phones. Plus I’m sure wireless charging will be slow compared to the phone being actually plugged in via lightening. Great technology this is and i think every invention are most important in our life. To make our life so more easy and enjoyable such kind of technology is needed so more.